Cartridges can create images that last up to 82 years. Produces images with 4-pl. ink drop size. 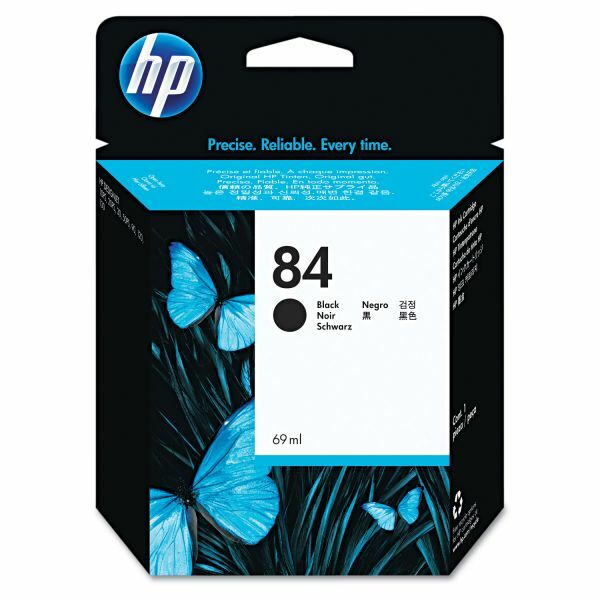 HP 84, (C5016A) Black Original Ink Cartridge - Get precise image detail and excellent gloss uniformity with HP's patented, dye-based black ink formulation. The HP 84 Ink Cartridge makes consistent photo-quality printing easy and reliable for an excellent value in your HP Designjet 10ps, 20ps, 50ps, 30, 30n, 90, 90gp, 90r, 120, 120nr, 130, 130gp, 130nr and 130r. HP ink is designed to deliver an optimal balance of image quality and reliability. Managing supplies is easy with HP Smart printing technology. Cartridge is easy to use and install. Wider print swath and 304 nozzles per printhead.